The typical KitchenAid attachments are only the tip of the iceberg! When I got my KitchenAid Mixer, I was already pretty familiar with the basic things I would be able to do with it: whipping, beating and kneading. I knew it would make my baking days a lot easier. I had no idea that there were in fact so many extra attachments that I could get that would make my cooking in general a breeze! In fact, getting a few extra attachments for the KitchenAid allowed me to get rid of some of my other kitchen appliances, taking away some of the counter clutter that I had been dealing with! Do you have some noodle nuts at your house? 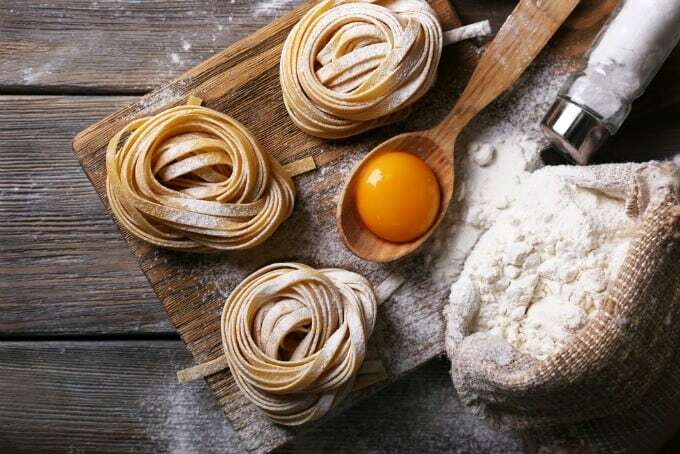 The difference between fresh pasta and dry is all in the making of it, or so would say your grandmother, but it doesn’t have to take a long time anymore. You can get attachments to roll and cut your own spaghetti or linguini, make shaped pasta like fusilli or macaroni or even stuffed pastas. Fresh ravioli, anyone? The ravioli attachment creates identical pockets for the top and bottom of the pasta, making it easy to stuff and line up before cutting them. With a solid ‘fit’, you’ll end up with less stuffing leakage during the cooking process. Pizza dough is another easy to make yourself item that gets even easier with the KitchenAid mixer. Family fun night just got even more fun with fresh pizza that everyone gets to put their own toppings on! Would you like to grind your own meat and stuff your own sausages? You can do those things as well! It’s not as hard as it sounds if you have a little help. Grab a Sausage Casing Stuffer and Food Grinder attachment plus your favourite meats and spices. 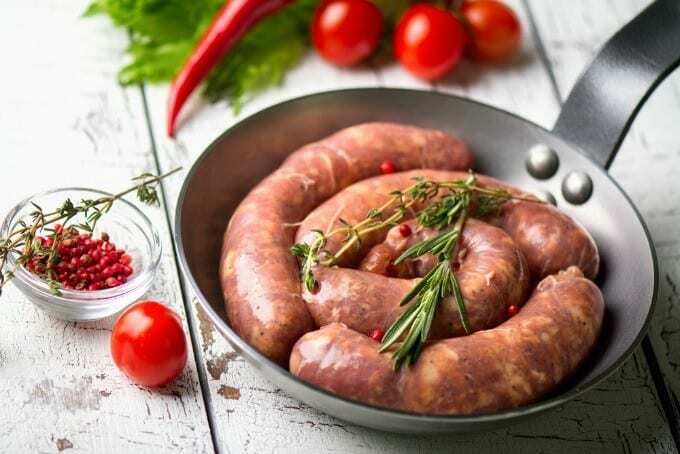 I’m craving breakfast sausages and these Sriracha Chicken Sausages – yum! Some other things you can make very easily using your mixer? Swedish meatballs – or any type of meatballs, really. Shredded cooked chicken for easy quesadillas or chicken tacos. Purée, slice and shred to your heart’s content. 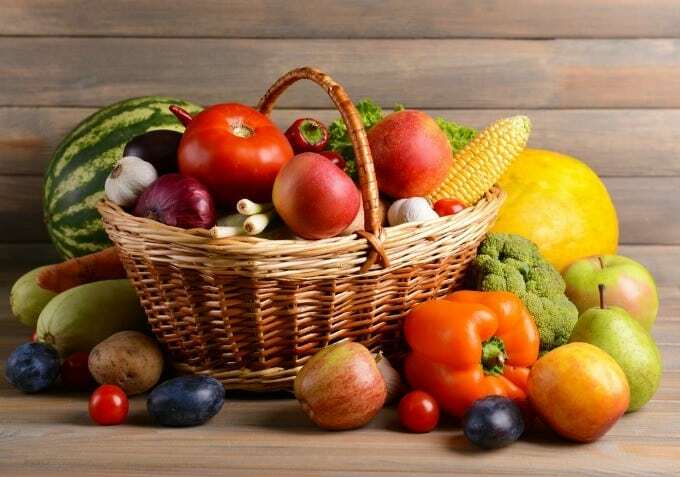 If you want to make baby food, you can purée fruits and vegetables to just the right consistency, quickly and easily. You can also juice citrus fruit for drinks or pies. Shredded cheese for your homemade pizza? No problem. Shredded cabbage for your Aunt Ida’s famous cole slaw? A snap. No need to slice your knuckles on the grater any more. Yes, you can buy an attachment to make your own ice cream with your KitchenAid mixer. The inherent beauty of this attachment is self-explanatory, isn’t it? A lot of desserts require an even hand in mixing – something that isn’t always easy to achieve with a hand-held mixer. Meringues, for example. Even buttercream frosting takes a lot of work with the hand-held to get that perfect, fluffy texture. 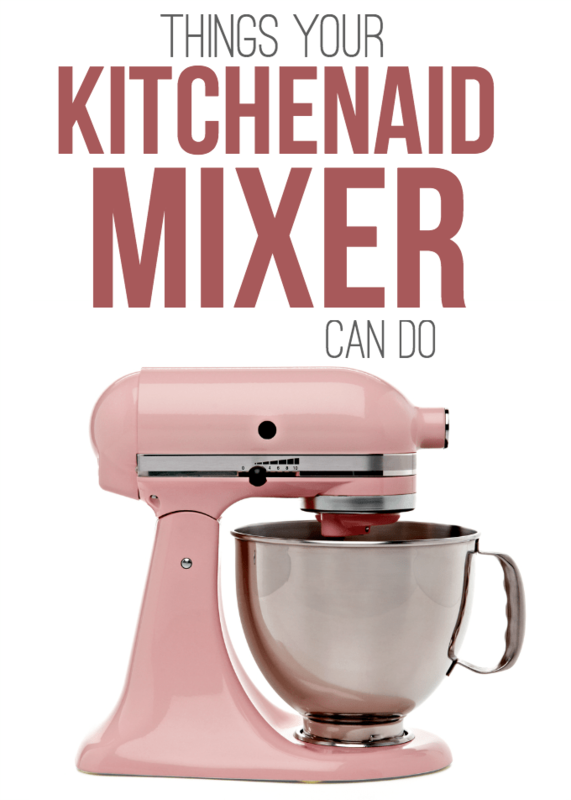 Basically, a KitchenAid mixer can help you do everything you do in the kitchen already and maybe encourage you to try a few things that you’ve never attempted before. Do you have any favourite dishes that you make with your KitchenAid? Have you tried out any of these attachments? Let me know! This is great! Just purchased a mixer for my parents! I love my Kitchen Aid mixer, unfortunately I don’t have any attachments for it as yet – the pasta one would be my first when I can afford it. I used to have a Kenwood mixer and had lots of attachments for it, I even made my own butter with it. I’ve always wanted a Kitchen Aid mixer! With all the attachments, would be even more useful. 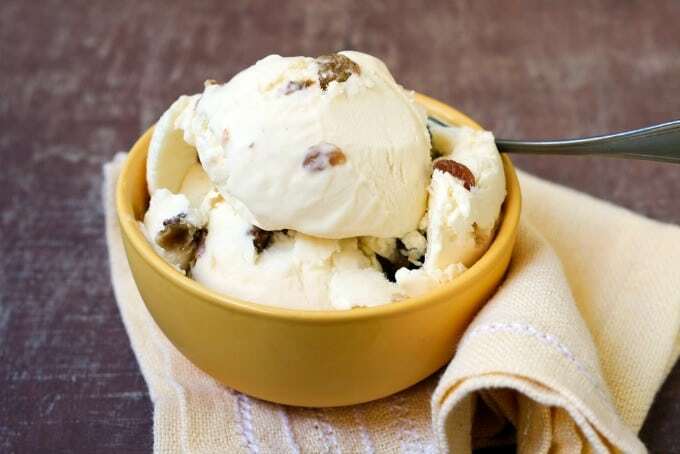 I’m thinking…home made real cream ice cream! To die for! I love my Kitchen Aid and wished I had the money to buy some of the attachments, I would love the pasta one and the sausage stuffer, guess I’m going to have to save my money or maybe next year tax return!! When I seen all the attachments a few months back I went crazy, the pasta attachment is amazing, I did not know about the sausage one, I am going to look for it. I have the meat grinder. Thanks for reminding me. I must get it out and use it again. Yes my daughter in-law wants the pasta extension for her mixer. I had no idea it had so many attachments – I’ll put one on my Christmas wish list! I really want a couple of the pasta accessories for my Kitchen Aid Mixer, just waiting to try and find them at a really good price. I don’t have any of the attachments for my mixer but I like the ice cream mixer attachment! My mom’s old Kitchenaid Mixer still works so I knew I wanted one. Shortly after I got married I purchased one and in the 15 years since it has been the best purchase I have ever made. If you want to get the Ice Cream bowl, hurry. I don’t know if they are discontinuing them all together or just at some stores but I just got one about a month ago at Best Buy for $39.99 marked down from $80. I know they work great I just haven’t had a chance to use it yet because you have to freeze the bowl and I literally have NO room in my freezer so I have to wait until we eat enough space to put it in there. I used to work for Whirlpool which owns Kitchenaid and I can tell you the attachments, although expensive, are worth it. The one I really want is the meat grinder. P.S. Kitchenaid dishwashers are made just as durable as the mixers. When I worked there over 20 years ago, people would call with a 25 year old dishwasher that worked perfectly, only problem was that the racks had rusted. I can’t speak about the rest of the Kitchenaid lune but with those two items, you can’t go wrong. Love my Kitchen Aide!! I use it to make sausage balls for Thanksgiving. So much easier to mix the ingredients.